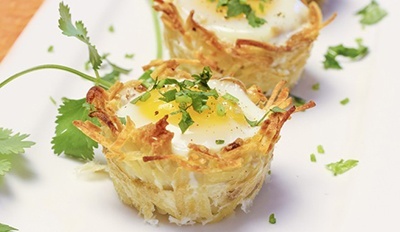 These adorable egg baskets are terrific for an Easter Brunch! Serve them warm or at room temperature. They reheat nicely the following day for breakfast if you have any left over! Bake the potatoes until almost tender (about 45 minutes). Allow to cool, then peel and grate them. Season well with salt & pepper. Spray two muffin pans generously with cooking spray. Scoop 3 to 4 tablespoons of grated potato into each muffin cup. Use your fingers to gently press the sides and bottom in each muffin hole to make a nest (don’t press the potatoes firmly against the pan; they should sit lightly in the pan.) Spray again with cooking spray. Bake for 15-20 minutes. Watch them to be sure they do not burn. Remove when golden brown. Allow the nests to cool. Crack an egg into each one. Sprinkle with salt and pepper and bake until the whites are set, about 15 minutes. Top with chives. Don’t be concerned if some whites bake differently. Remove from the muffin pan with a spoon and fork and serve.